Judicial Independence in Context. Toronto, ON: Irwin Law, 2010. In the Canadian context, judicial independence - the “cornerstone of democracy” - is described as dependent on a wide variety of conditions, including judicial remuneration, court budgets, the discipline of judges, politics and the appointments process, but these do not usually include a diverse judiciary. There is also a significant, but almost completely separate, Canadian literature about diversity on the bench. Why the separation? Part of the reason is that judicial independence (like any concept worth its salt) is not particularly well defined. Attempts at definition are often cabined by jurisdiction or limited to the world of theory. Furthermore, judicial independence is not a “goal in itself,” but rather a means to impartiality and legitimacy, so that links between diversity and legitimacy and impartiality might not explicitly mention judicial independence despite a clear connection. Another possible reason for the paucity of direct considerations of the topic may be the sense that we believe we have established institutional level judicial independence in this country. Thus even the government is prepared to accept that the bench ought to be diverse, and many will recognize the problem of a bench that lacks diversity – but we cannot recognize it as a judicial independence problem. Most of the commentary about judicial independence consists of the argument that a given change or group of changes (usually changes initiated by government) is harming judicial independence. Linking diversity on the bench to judicial independence, on the other hand, would suggest that we have not truly had judicial independence in the past, since historically it has been undeniably a homogenous bench – at least in terms of race, ethnicity and gender. The context of many judicial independence controversies means that arguments for judicial independence are often - read simply - arguments against interference with existing practice. Demand for a diverse bench, in contrast, usually consists of requests for a break with past practice. 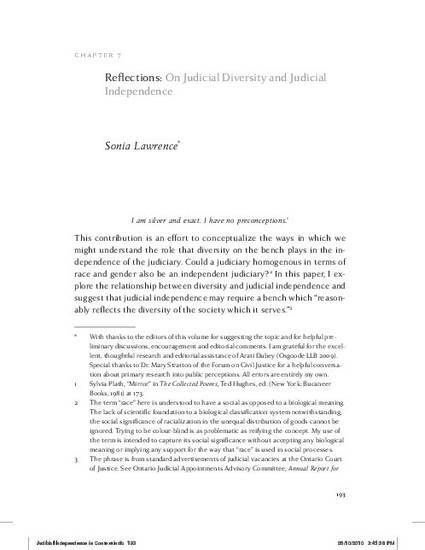 Establishing the link between judicial independence and diversity on the bench brings in new questions and opens new areas for research and policy making.In part I of this paper I begin to sketch an answer to the question, “can a homogenous bench be an independent bench?”, focusing on democratic legitimacy, public confidence and the idea of structural impartiality. In part II, I suggest that ‘diversity’ cannot cure the problems that have been identified, and that legitimacy and public confidence require some attention to the courts as representative institutions. I then attempt to sort through the complications arising from this suggestion, and defend the notion of a representative bench from some of the main critiques. Part III briefly describes two systems of judicial appointment in Canada, and the different approaches they take to the question of diversity and representation. Finally, I conclude by describing basic research questions which arise from this exploration, and accepting the limitations of calls for a ‘reflective’ bench. View this research paper on SSRN SSRN.